Robert De Niro has long been one of my favorite actors, and is one of our greatest actors of all-time. But, he makes a lot of films, and over the past several years, it has been “hit and miss” – some have been good, and some not so good. Anne Hathaway is one of our better actresses today. Having seen the trailer for this film several times, I was really looking forward to seeing the film. And it really delivered – getting high marks from all in our Friday Night Movie Club. De Niro and Hathaway have excellent chemistry and lead a solid cast, which also includes Rene Russo and Linda Lavin. The film is written and directed by Nancy Meyers (It’s Complicated, Something’s Gotta Give). It was filmed on location, mostly in Brooklyn, which we enjoyed as our group was just there on vacation two weeks ago. De Niro stars as 70-year-old widower Ben Whittaker. Ben has discovered that retirement isn’t all it’s cracked up to be. He was successful in business for forty years, and likes to stay busy, so he decides to apply for a Senior Intern Program at an e-commerce business “About The Fit,” where he is assigned to the founder, Jules Ostin (Hathaway). But Jules is extremely busy (running an hour late to every meeting), and initially has no use for an intern. Jules’ assistant Cameron (Andrew Rannells) tells her that despite the company’s success, their investors would like to bring an outside CEO to the company. Jules is devastated with this news, but begins interviewing prospects as requested. Jules is married to Matt (Anders Holm), who had been the more successful of the two, but decided to be a stay at home Dad to their delightful daughter Paige (JoJo Kushner) so that Julies could pursue her work at “About The Fit”. But Jules’ work life is out of control and Matt is getting ignored, and their relationship is suffering. One of the most enjoyable parts of the film is Ben’s interactions with his 20-something male co-workers, who don’t quite know what to think of him initially. He gives them advice on relationships, responsibility, attire and professionalism. The film features some adult language, but not much compared to most PG-13 films, though God’s name is used inappropriately several times. There are some suggestive scenes, though nothing is shown. We really enjoyed the film, but it ended abruptly, and a bit up in the air. We could think of better alternative endings. We don’t see any of the characters in the film demonstrating any faith. Regardless, this is one of my favorite movies of the year and highly recommended. 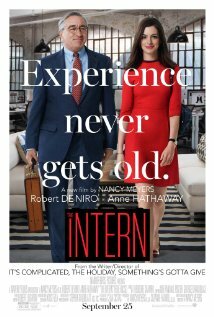 Categories: Movie Reviews | Tags: Anne Hathaway, Christ and culture, Christianity and Culture, Coram Deo, movie reviews, Robert DeNiro, The Intern | Permalink. Thank you! I’m seeing with my parents tomorrow so I’m glad it got good reviews by the “Pence team Critics!” We are looking forward to seeing it. Millennium Girls day is packed with 205 girls 5th grade to 8th grade- lots of excitement, tons of learning, and bags of treasures and free stuff. They are learning team building, strategy, how to build web pages, cool apps and computer games, about robots and other innovative technology. The girls I’ve talked with, including Lexi (who didn’t want to come) can’t wait until next year to come back!